Fangirl Review: Hero Initiative & Dark Horse Comics Unveil 'The HELLBOY 100'! 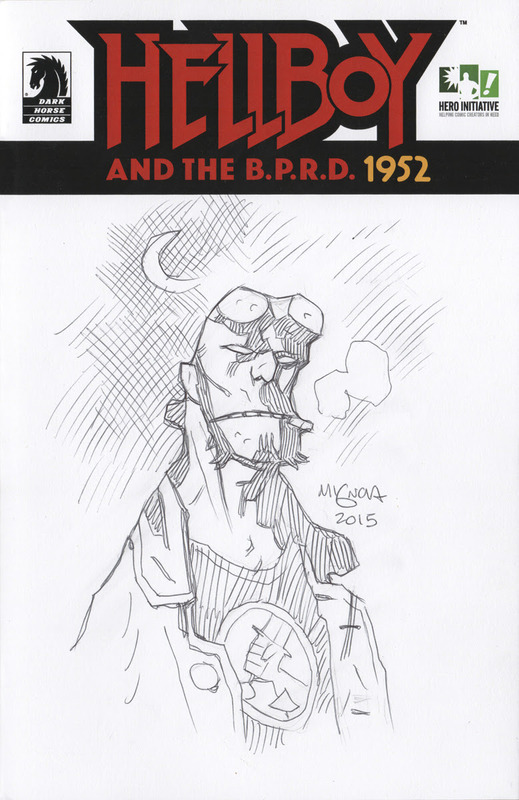 Hero Initiative & Dark Horse Comics Unveil 'The HELLBOY 100'! The Hero Initiative, the first-ever federally chartered not-for-profit corporation dedicated strictly to helping comic book creators in need, unveiled its latest project today, The HELLBOY 100, in collaboration with HELLBOY creator Mike Mignola and Dark Horse Comics. To create the HELLBOY 100, Dark Horse Comics printed 100+ blank covers of the landmark first issue of HELLBOY & THE BPRD: 1952, written by Mignola and John Arcudi and featuring the art of Alex Maleev with colors by Dave Stewart. The Hero Initiative then commissioned internationally renowned comic book artists to do an original drawing on each cover, including Gabriel Bá, John Cassaday, Fábio Moon, Eric Powell, Bill Sienkiewicz and Mignola himself. The originals will be auctioned off via eBay.com at the rate of approximately 10 per week for 10 weeks. Both hardcover and softcover editions of a book collecting all the covers will published by Dark Horse Comics in September, 2015. ABOUT HELLBOY: Hellboy has appeared in graphic novels and comic books, prose novels, two animated features, two live action films, and toy lines.